There are some pretty hot game sales/price reductions in the Android Market right now. I've marked my stronger recommendations with a *. OrangePixel has been making pretty, little Android games for quite some time. I still like their Mini Plane and haven't tried many of their other titles, but Gulp! looked interesting. And I like interesting. In Gulp! you play the role of a little guy at the bottom of the screen with a really long tongue. Perhaps it's supposed to be a frog... that I don't know. Yummies (and bonus crates) fall from the sky and you have to zap them with that tongue of yours before they get to the bottom of the screen. The bottom of the screen is divided into pieces of flooring and if anything hits it then that segment is destroyed. If you eliminate the Yummy before it gets to the bottom then a piece of food falls and you can pick it up for points. Those crates I mentioned can also be caught with your tongue to activate various power-ups. Finally, should anything hit you then it's game over in the most immediate sense. The graphics for the game are pretty good as is the audio. Nothing steller, but better than average. The controls are simple. Tilt left or right to move. Touch left or right of your little guy and out comes the tongue at roughly a 45 degree angle. The challenge is in lining up those shots as you have no control over the angle. Fortunately, as the tongue extends and retracts all that has to happen is for the end of the tongue to come in contact with an enemy. At first I really didn't like this game. It felt clunky to control. After playing it and trying to give it a chance I've warmed up a bit and would say it's a little above average. First, my biggest issue is that I don't really like the controls. They feel awkward. But then, after playing for a little while coupled with the game using a portrait perspective I found that my wrist started to hurt. Most games that use the accelerometer for tilt control tend to take on a landscape perspective so that I use both hands to tilt. The portrait mode used here lends itself to having me hold my phone with one hand and use one wrist to tilt ultimately leading to discomfort. Keep a bottle of Tylenol on standby. I really think that using landscape mode (and yes, things wouldn't be able to fall as far visually) would have been a big improvement. Next, after playing for a bit and being annoyed with the angular firing mechanism I realized staying in one place and waiting for the enemies to come to me was a good strategy. It's not perfect as waiting in one place doesn't give you enough time to pick up much of the dropped food and sometimes a Yummy will descend in my column, but it improved my performance. Finally, I don't really feel like I'm playing for anything other than a number. Ok, there are different levels with different background and such, but I can't say that I'm motivated to advance. That said, playing for a number isn't all bad... it just classifies this as more of an old school arcade game. In conclusion, Gulp! comes down to being a take on the Space Invaders/Galaxian genre with angular firing and the addition of picking up dropped objects. In fact, it reminded me of an old Atari computer game I wrote 25 years ago with the 45 degree shooting element where space birds would fall and the player would have to pick them up. My game stank, though. This one is good, just not great. 3.5/5 stars. Take a look at the video below for more details. I could use a good music game I thought as I downloaded SCT Smash. Back in 2005 I really got into Dance Dance Revolution and, in addition to losing a lot of weight that has since come right back, it was a blast to play. Addictive! There were songs that would call me back to play that game every night. I know DDR clones on a phone are a bit lame, but they can still be fun if you let your fingers do the dancing instead. I thought that's where SCT Smash looked like it was headed. SCT Smash is a simple game. There's a big, wooden mallet that taps on some blocks and musical notes march towards the trees chiming away with every step. Ding ding dong... ding ding dong... Once a note reaches one of these blocks you have to strike it with the mallet. If it makes it past the block then you lose a life and you start with three lives. Every note you smash is worth a point. Smash 200 and you get an extra life although fat chance that will happen. 1) The controls just aren't well done here. They're simple, but they're not smooth. Tap on the left/right sides of the screen to move the hammer. Tap on the hammer to strike. Sounds easy enough and it is, but it so annoying having to tap three times to quickly squash a note on the other side of the screen that landed there during the same cycle and it certainly isn't fun. It feels like busy work. Some games are hard because they're challenging. This is hard because it's a pain do. 2) In a music game I'd expect the music to play a major part in it. DDR was addicting because as I jumped around it was as if I was at one with the song. It almost felt like I was conducting it. It was a beautiful feeling. Here, there's no real 'music'. Instead it's random chimes and hammer smashes. I hoped that I'd be playing a little ditty like some of the pocket piano programs do. This game doesn't draw me in at all. It didn't take long for me to tire of SCT Smash at all. It's pretty clear there's some talent behind this game with respect to the arts, but execution of a game is absent. There's also this odd feeling as the way the game zooms in to this cluster of trees made me feel like I was about to bear witness to a masterpiece. I'm always up for something cool and innovative and wondered if that's where this was headed versus games like DDR, but instead it's several steps back. If the notes simply scrolled and I tapped where the hammer was supposed to tap I'd have been satisfied. Take a look at the video of game play below where the author prooves he's a lot better than me at this game (although the video doesn't appear to be the Android version as the 'lose a life' music doesn't match... it's better on Android). 2/5 stars for a game that's missing the fun. It's the only Flash game that garnered any of my attention because it's basic, quick, and frustrating as all heck to play. Friction Mobile is an Android port of this game concept. In Friction Mobile you've got a cannon at the bottom of the screen that fires little, expanding balls. The cannon just rotates back and forth and back again. The only thing you can do is click to fire. Usually I play this game with just my thumb. When you fire the ball bounces around with friction slowing it down until it comes to a stop. It then expands until it can't expand any further (i.e. comes in contact with the edge of the play area or another ball) and you have to hit it three times to remove it and earn a point. How does the game end? Quite simply, when one of the balls you fire comes all the way back across the bottom line (where your cannon is). The thing that made me think of this game was actually Angry Birds because as the levels get harder in that I find the game more frustrating. Yet, I keep coming back for more punishment. In Angry Birds sometimes I know what I have to do, but the aiming isn't precise enough to translate that into a completed level. In Gimme Friction you can mentally line up a shot, but getting the 'click' to happen during the right millisecond is hard. Personally, I do think the Flash version is better. I think the more square-like screen is better for the game, but maybe that's just because I started playing that way. The cannon also moves a bit slower so as to make me feel like I've got more of a chance in the game. And I also happen to like the background theme. My high on the Flash version is 22! This is a freebie so if any of this sounds interesting there's no cash barrier to downloading the game and trying it. I usually play it a few times and then forget about it until I see it in my favorites later and have another go at it. Now I can carry it around in my pocket to play during the vast amount of time I spend outside ladies rest rooms (and no, I'm not a pervert... just have a family of women so someone always needs to go). Earlier this year I reviewed a game called Steel Shot. I wasn't too excited about it because when firing the sling shot in the game my target is several screen widths away. At the time, I was ignorant of the game Angry Birds and that it was a hot commodity on the iPhone. I learned about it soon after my review as it was the top game in iPhone land. Why? 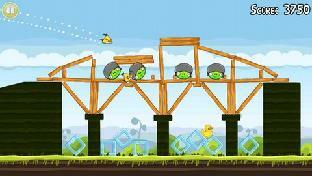 The premise behind Angry Birds is simple. Some naughty pigs have stolen some eggs from a bird's nest and the birds are now... any guesses?... ANGRY! Do they want their eggs back? No. They want REVENGE and they're willing to sacrifice themselves to do it. So we see the pigs at home in makeshift shelters and we have to topple them and crush the pigs by loading birds in a sling shot (apparently flying is out of the question) and firing them at the pig's domicile in an attempt to knock it down. Angry Birds sports some cute graphics, outstanding audio, and the simple, touch based controls work well. Well, they work well if you like firing at something you can't see when you pull the trigger. But I think the targets in Angry Birds are generally only about a screen length away so it's not as bad and this makes for a much better experience that the aforementioned game. What really makes this stand out, though, is the emotional experience. If you can draw someone emotionally into a game, movie, book, ... whatnot then you've got a satisfied customer. I still remember when Kerrigan became a Zerg in StarCraft, but only because it was an emotional experience. Angry Birds has you wanting to clear the next screen just so you can hear the birds cheer with excitement, do little flips, ...etc. It makes you feel like you're one of them. The kicker, though, is that when this high profile game was released in final form today it was released as a free, ad supported game. FREE!?? They could have easily charged a buck or two easily, but no... free... as in 'no reason not to get it'. I'm not entirely sold on this style game for my original reason and I certainly don't think this is even close to being the best game ever. I think it's more of a fad game. But I think I understand why others love it so much. It's cute, has a bit of a puzzle element (i.e. where to fire your bird), and creates an emotional bond with you and your birds. Heck, I'll admit that when playing the final version this afternoon it's got an additive charm that made it hard to put down. And free? 5/5 stars for a game that gives a whole new meaning to giving someone the bird. When I was a youngster we used to vacation in Canada every year in a fairly isolated place on a lake. While the swimming was fun there was always the question of what to do on a rainy day. One game I became acquainted with was Poker Squares. In Poker Squares you shuffle a deck of cards and play them one by one from the top of the deck onto a 5x5 grid. Once you've played 25 cards you get points for each row, column, and diagonal based on the poker hands you make and you compete with yourself to earn higher scores. Lock 'n' Roll does something similar to this with dice. In Lock 'n' Roll you roll four dice... well, actually you don't as color is one of the attributes that can appear and only the numbers 1-4 are available. Instead you press a roll button and get four dice each with a number and color (and there are four of each) and you play them onto a 4x4 grid. 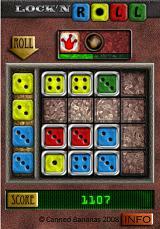 After you've played your dice you press Roll again at which time scoring occurs and you get a net set of dice to play. Scoring is done by looking for combinations on the board such as 'all of one color' or 'two pair' or 'one of each color AND of each number'. Some combinations 'clear' which means after scoring is completed the associated dice are removed from the board. This is critically important as once you fill the board with combinations that do not clear your game ends so you need to keep clearing combos in order to rack up higher scores. You can also earn joker (aka wild card) dice after scoring preset amounts of points, but when a joker is used to complete a combo it reduces the combo's score. The game has a nice tutorial and reference page (that can be accessed while playing). My only complaint with the instructions is that I can't find a list of where the dice can be played to form a scoring set. It appears that in addition to horizontal, vertical, and diagonal rows that all 2x2 squares are eligible as are the four dice in the corners. The graphics are simple and the sounds consist of pleasing tones during scoring and such. Controls are all touch screen based and involve pressing buttons and dragging dice. I didn't have any problems whatsoever with controlling the game. Furthermore, dice are not locked into position until you click 'Roll' again so if one was to stray you can always grab and reposition it. Lock 'n' Roll is a game that's simple to play, but takes time to improve at. Some might look at this as a 'luck of the roll' game as surely you will create situations that depend on rolling specific results. I prefer to look at it as a luck management game. What's going to give me the best odds of success? It also takes time to memorize the combinations that score and the locations that tally points. Even now, I sometimes get that bonus combo that I didn't plan on. The idea of clearing dice is what really make this game so much better than Poker Squares as it yields the possibility of infinite scores. Finally, I tend to use my jokers up way too fast. Save them for when you're in a jam. The game comes in a free version with ads and a paid version that includes global leader boards and eliminates the advertising. The QR Code to the left is for the free version which is what I've been playing, but as usual, if you find yourself playing this for over an hour then I'd say you owe it to the developer to buy the full one whether you want the extras or not. In conclusion, this is an entertaining dice game similar to that game I played on vacation several decades ago, but with more going on. It's a rush to keep the game going and earn a new high score, but I'm glad there's a free version as this isn't the next Tetris (i.e. it's not for everybody). Some will be frustrated and stammer away claiming 'bad rolling'. While bad rolls are par for the course in any dice game it's not the 'be all and end all' as that won't happen in every game. 4/5 stars for a great game to play on the train to work. A good RPG style game with a solid story and good character development can be hard to come by. What's worse is typically finishing such a game means it's time to find another as replaying an adventure game is akin to watching a movie over. It might be entertaining, but it's just not the same as the first time through. So I welcome any new RPGs and doubt I could tire of them as I have with categories such as the 'match 3' genre. Legends Arcana is a new RPG from indie developer Little Killerz. In this game, and I won't reveal too much story, you are awoken and placed into service to pay off your debts. You start off in town, aren't terribly popular, have no cash, and only scraps for weapons and armor. No, I don't think that's an amazing start to a story, but the graphics are pretty and the game also features some nice cut scene artwork with comic book style dialog. You can then wander around town and discover the weapons shop, the tavern, the apothecary, and visit with the frog that gives you tasks. Yes, I said frog... a big frog. I've seen people criticize that as amateur. For me it's more creative that the same old, same old and it certainly shouldn't be a distraction even if you're anti-frog. One of the neat things is that each shop has its own graphics when you enter and the game doesn't just pop up an 'items for sale' screen. They went the extra mile with this game. So you leave town and head down to the dungeon for your first encounter. The trees blow in the wind and after a few wilderness encounters you should find the entrance to the dungeon. Walk on in and start waving your sword around and you'll soon discover that most stuff can be destroyed. Yes, tables, chairs, and treasure chests all smash to pieces. After you slay some monsters and pick up their gold you'll get to places that have traps... you'll find scrolls... and it will be fun. Funny thing. When I first played, (please, skip to the next paragraph if you don't want to know a thing about the game), I was fighting some bats and killed them all, got the scroll and it summoned a pet. Next thing I know I've got another nasty bat on my tail that I try and try to kill with no luck. I spent five minutes trying to slay this doubly strong bat before I realized "oh, he's (or she's) my pet". I was expecting something fluffier, I guess. As you progress you'll be able to buy better equipment, upgrade your character with skills and skill points, and advance to bigger and bolder challenges. There always seems to be purpose, though, granted the missions aren't exactly rocket science. This is certainly more of a hack and slash, dungeon crawl kind of game with a decent story on top. One interesting thing to me is that the developers say they're happy to fix and bugs and promise a big update forthcoming. I don't buy a game based on something 'coming soon' anymore and the 'bug fix' request while friendly seems a bit weak. I don't want to be a tester. But be assured that the game is in good enough shape now to play. There are issues such as when I walk into the lower right building on the east side of town my character can get stuck and can appear to walk out of the side of the building. Likewise, the game seems to allow for some use of a physical DPad instead of the on screen ring of control, but when I tried that my character started to always head to the upper left and would no long remain stationary. 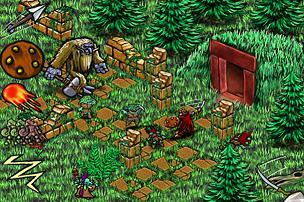 Legends Arcana has a lot to it and makes for a great isometric, dungeon crawl experience. I've enjoyed the time I've had with the game and look forward to more progress. I like the fact that there are different monsters and treasure to find and the game has a good personality with its entertaining, comic book dialog, and expecially the occasioanl trap. It's easy to get carried away, ignore your health meter, and meet your doom. 4.5/5 stars. A list manager for creating grocery lists... etc and among the lists on the screen is Birthdays. Wouldn't a calendar be better? Than again it is the ONLY phone with Live Tiles (and not Widgets)... I'm sad as I really was hoping Microsoft would have something somewhat impressive. Bonsai Blast is $0.99 from $1.99 and gets rave reviews. Call of Duty: Modern Warfare is on sale again at $0.99 from $2.99, but gets mediocre (or worse) reviews. Never To Be Konquered is half off at .99 euros and looks to be a nice little RTS. Neon Wave looks to sport some flashy, neon graphics for a vertical shooter and is 0.79 euros (from 0.99 euros). Sky Force is an excellent vertical shooter and has been reviewed here. It's only a pound (about $1.70) down from 2 pound. Spaghetti Marshmallows is a puzzle game that I've wanted to try and is a third off at 20 SEK (about $3.00). Tony Hawk VERT sounds like an average, 2D Tony Hawk game for $0.99 (from $1.99). We're starting to get to the point when new initiates to the computing community don't know the story of the PC. If you're interested in it then please check out the movie Pirates of Silicon Valley . It's about Bill Gates and Steve Jobs and has some great quotes in it such as "keep your friends close, and your enemies closer" and "good artists copy, great artists steal". It also has a basic history lesson in it and this history lesson is, I suspect, repeating itself. The PC became the top selling computer knocking off competitors such as the Apple II, Atari 800, various Commodore models... etc because of several factors. One being that IBM was a powerhouse company and spent a lot on advertising it with their Charlie Chaplin ads. Another being its open architecture with the ISA bus allowed for massive flexibility. But the biggest reason was that IBM let Microsoft license the Operating System to whomever they could creating a massive market of cheaper 'PC clones'. People like the same thing for cheap. There was a smaller 'clone market' for the Apple and my friend across the street (we're talking 8th grade) had a 'Pineapple' clone. If I recall, they weren't legal so that made their distribution more of an underground activity. PC clones were freely available. So, today we're seeing the mobile wars fought before our eyes. The proprietary Blackberry... the proprietary iPhone... and the open Android. With the exception of an odd loss in court, Android can't lose. I only wish it was simple to invest in the company that sells its operating system. With Android we're going to have some of the problems that plague the PC such as 'this game doesn't work with a Hercules graphics card' and developers will have to support a variety different system specifications (i.e. input methods, screen sizes, CPU speeds, ...etc). Fragmentation will be an issue, but Android will be the dominant platform. Why do you think vendors are fighting over who's going to run 'the' app store for the Android? Amazon, Verizon, ...etc see dollar signs. As much as I hate the idea of a fragmented market for apps I also think it's neat that such options can exist versus it being Apple's way or the highway. Microsoft has their Windows Phone 7 debut on Monday (Ocotober 11, 2010) and it was a painful thing for me to move away from Windows Mobile last November. I'm a Microsoft fan. I think Microsoft has made a lot of good stuff and a lot of bad stuff. I don't think they are perfect. I'm also a Microsoft fan that thinks they need leadership from someone other than Steve Ballmer. Microsoft, I hope you prove me wrong on Monday... but nobody is going to beat Android unless they open things up. Apple isn't going to. I think it would be a mistake for them to do so as that's not their business model and never has been. They sell slick, overpriced merchandise (although overpriced is relative). They have their following and their following can watch Android grow. Android wins! Move It! bills itself as a "fresh and exciting block-sliding puzzle that isn't another 'unblock me' clone". In layman's terms that means it's an attempt to copy the success of Rush Hour without just copying the game as so many other puzzles on the Android Market do. I've reviewed a few of these types of games and gave the cake to the official Rush Hour with its 2500 puzzles, pretty and colorful graphics (most just use blocks instead of cars), and solid play. What does Move It! try to do differently in an attempt to beat Rush Hour at its own game? It adds shapes beyond the simple rectangle. Move It! 's graphics aren't anything to write home about. Simple block shapes with some shading. It does bill itself as a block puzzle, so blocks aren't exactly out of the question. Still, there's something appealing to people about themes such as 'get the car out of the parking lot' instead of 'move the red block over here'. The game has nice, relaxing background music that plays as you play. But it's not about graphics and sound here is it? It's all about the puzzles and the puzzles are good. The game is easy to control with simple swipes on pieces and it does offer others options although why you'd use them is beyond me when touch works well enough. The game's real competition, though, is the plethora of games of this type. All in all I really can't say I like Move It! better than Rush Hour. It's good. It's enjoyable. It's be great if it was the first of its kind. But the relaxed shape constraint really doesn't add a whole lot to the game. It's still moving objects around to ultimately move another object to its destination. With 672 puzzles in the full version this game is certainly worth the money, but if you're going to choose one or the other I still have to give the nod to Rush Hour especially given that it has almost 4 times the number of puzzles for a dollar or so less. In conclusion, this is a solid puzzle game that is a nice addition to the Android Market, but competes with countless other pre-existing puzzle games. If you're done with Rush Hour and looking for more, then this is what you've been waiting for. If you loathe block moving games then this won't convert you. If you enjoy Rush Hour and are looking for something a tad different then this may be for you. And you've got nothing to lose in trying it with the free, ad supported, 72 puzzle version (and the QR code is for that). 4/5 stars. Soccer Superstars was released a couple of weeks ago and back then I promised a review. It's taken awhile because this isn't a simple game, but it's finally complete and serves as part 2 of our 'Soccer Tuesday'. 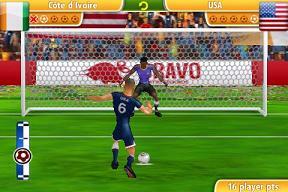 Soccer Superstars is an arcade oriented soccer game. It reminds me a lot of the feel I'd get from the old NeoGeo sports games. The characters are cute (and small), the music is invigorating, and the action can be frantic. Soccer Superstars starts with a nice tutorial that first explains the various screen elements and then proceeds to explain the controls. I was hoping that I might be able to use my DPad for controls as I really think tactile feedback is important for this kind of game. After excessive experimentation is appears that the N, K, and L keys acts as the onscreen S, A, and B buttons and the DPad controls my player. Unfortunately I can't change that and the N, K, and L keys are too close to my DPad to make this useful. So I'm basically stuck with the onscreen controls and the fact that my fingers drifting from them causes a periodic interruption in my play. One compensation the game makes is that your player can dribble the ball without you touching anything. Just point in a direction and he's off. Holding down the virtual DPad in a direction simply gives the ball dribbler 'super speed'. The graphics are nice although the play elements are a bit too small and the audio is excellent. The game plays smooth. The controls are fine for touch screen based controls. I've reviewed too many games and criticized many for not supporting my hardware DPad and keyboard. The same applies here and I won't rehash that aside from saying "We're NOT iPhone owners... some of us have hardware DPads... please let us start using them." When I first played Soccer Superstars the action was frantic. I didn't have time to think or plan a strategy for moving the ball down the field. It was a barrage of shots against me with some going in my net. I checked the options for skill levels and none were to be found. Ah, but there is a speed option. I cranked that down more to my liking and would have to say it's the equivalent of choosing among various skill levels. Now the opposition moved more in line with what a rookie could handle. I gave up a goal in the first half, but was able to net two of my own in the second including one on a penalty kick. Time to move the speed up a notch as that gave me just what I needed to start gaining some comfort with the controls. All in all Soccer Superstars plays a good game. The one thing I didn't like about it, though, was that it is always selecting the player closest to the ball as my active player. I'd be running down the field and wham I'm over here and now I'm over there and... as the opposition dribbles and passes down the field. I wish there was an option to allow me to choose when to toggle to the player nearest the ball instead of the game. The thing about Soccer Superstars, though, isn't just the game itself which is very good indeed. It's the massive amount of options you have. You can play a single exhibition match, you can play in a league, and you can even be a player that you developer over a period of seasons much like the consoles do. There's a lot of depth here for the soccer fan and you can tell where 'World Cup' should be used, but isn't, presumably due to licensing issues much like a football game with 'NFL' left out. Sure, there are things that could be improved upon. And yes, it's among the higher priced Android games at $4.99 (and that still ticks me off when I see the iPhone version is $0.99). But all things said and done this is a fantastic soccer game and perhaps the best on Android (not that there's much competition). It has a great tutorial to get you started, quick play if that's what you want, lots of depth if playing a season (or series of seasons) is up your alley, plays well, and they even added App2SD support recently so it is being supported as needed. 5/5 stars. Terminal5 is a spacial relationship oriented puzzle game that is much akin to the board game RoboRally in a puzzle format. In this game you control a robot and have to navigate through the board to get to the end square. Naturally, some of the squares have stuff on them that does stuff such as move you a spot forward, fire a laser, or rotate you. So, to get a better idea let's take a look at a screenshot. At the bottom of the screen you have preassigned number of each possible move (forward, rotate left, rotate right, and u-turn) to use to get through each level. Above that you have a list of 'commands' you have assigned to your robot for the round... in this case a forward, rotate left, forward... etc. Above that is the board and your robot is along the bottom just one square over from the left side of the board. The green plus in the upper left is where you have to get to. I won't go into too much detail as to what everything on the board does, but, for example, if you moved forward onto the yellow, curved arrow it would automatically rotate you and move you forward an extra space before your next move executes. 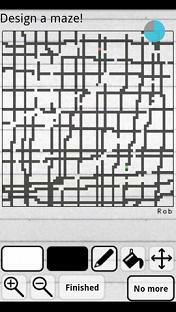 The idea in RoboRally is that you're programming your robot with multiple steps at a time to get through the level. 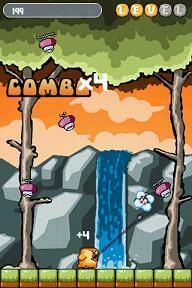 Along the top, the 6 indicates you have 6 rounds (or 6 sets of 8 commands) in which to finish the level. The 1 is your life. Some levels give you multiple lives so that you could, for example, deal with one laser blast, but not two. 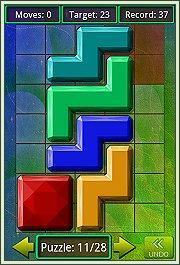 The complexity of this game is contained within each puzzle. The game includes an excellent tutorial mode that explains what the different objects on the board do along with some nice, easy 'puzzles' to get you started. The puzzles in the game are substantially more challenging. One, for example, didn't allow me to make any left or right turns. Needless to say, I had to rely on meticulously placed board elements to work my way through the level. And that's the main problem with the game... it needs more than 28 levels. A simple level designer might even be nice if the game could garner enough of a following such that others were interested in creating levels. I can only hope that additional levels are coming. The game costs 2 euros or about $2.75 so that works itself out to about a dime a level... still relatively inexpensive entertainment as the levels are pretty good. Still, it would be nice if the game didn't end so soon for those of us enjoying it. 4/5 stars for an enjoyable puzzle game that needs a bit more. A lite version of the game is also available for download from the Market. Here's a link to a video from the developer as well as a link to RoboRally on Amazon if you're interested in a similar, multi-player board game that probably provided some of the inspiration for this Android game and is a lot of fun! Back when I was in high school I had to take a test. This test consisted of copying information from one page to another. It was easy! I copied as much as I could as accurately as I could and when the results came back I did surprisingly poorly. No explanation was given other than a percentile score versus other students. The test itself was based on accuracy and how much one could get done in the allotted time. I like to think the problem was that I'm more meticulous than others so while my accuracy was high I wasn't racing through the exam to get the most done. ﻿﻿ So what does that have to do with Monsters Splatter? In this game, rows of monsters descent upon your Android's screen and you have to eliminate them before they get to the bottom. Doing so is easy. Just touch three like monsters in sequence and a triangle of death destroys everything within its bounds. There's a bit more to it than that, though. Some monsters have double strength and have to be killed twice. Then there are the pumpkins and the holy water. If you destroy a pumpkin then two extra rows of monsters quickly appear. If you destroy holy water then all monsters of the type forming the triangle are also destroyed. Furthermore, pumpkins and holy water crossing the bottom of the screen are harmless. The graphics on the game are good with nice little monster icons that look like they came from an emoticons clip art gallery. Sound is done well too with some nice extra monstrous sounds when destroying the pumpkins and holy water. Controls are simple and the monsters are basically large enough to make touching them error free. Rarely did the game and I disagree on which monster I had selected for doom. The problem with the game for me is that it's just not terribly exciting and reminds me of my clerical aptitude test I took so many years back. It's pretty straight forward that you're going to want to destroy the monsters at the bottom first and that there's no other choice when they get a few rows away from end game. There's some thought as to how/when to trap the holy water and possibly avoid the pumpkins. The game does get harder by playing faster and the later levels do get quite difficult. Yet, I'm not so sure there's much I can do about it other than play faster. It almost seems like too much twitch in a pseudo-strategy game. Monsters Splatter also represents my first obvious encounter with the new Android copy protection where my license is validated on the server. This means then when I first tried to play that it promptly shut down on me saying it couldn't validate my license because of a lack of network connectivity. This was when I HAD network connectivity. I like to give apps the benefit of the doubt so I tried again and no problems. I then decided to shut down all network connectivity and run it again. Once again, no problems. I'm pleased to see that, with the exception of my first load, the system seems to work ok. I presume after a preset amount of time it'll need to validate with the server again and that's fair enough. I fully respect the need for Android developers to protect their games, am glad to see something done about it, and hope this new method delivers results. In conclusion, this isn't the game for me. Then again I'm not a big fan of a lot of these lighter puzzle games such as the acclaimed Peggle. If you like those kinds of games then this might be a nice addition to your library. At half a euro it's certainly priced more than fairly and that alone did result in me keeping the game mainly for others that might want to play a simple game on my phone. They have also released a free version that is ad supported so it's probably worth a try just because of that. 3.5/5 stars for a game that's well done, but just doesn't make me scream with delight.